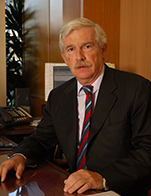 Panos Laskaridis was born in 1947 and has established Laskaridis Shipping Co.Ltd. in 1977 and Lavinia Corporation in 1978 which developed into a vertically integrated Shipping Group controlling a large Reefer, Bulker, Fish Factory and Tanker Fleet, two shipyards in Spain, fishing and fish trading activities, various agencies, shipbroking and shipoperating companies in Europe, the Far East, South America and the USA along with various other shipping related business. He oversees the day to day business of the Group which employs some 3500 people. He has over 40 years experience in shipping and has been involved variously in other Group related business in Leisure, Gaming and Real Estate. He holds a Mechanical Engineering Degree from Braunschweig University in Germany, a Master's Degree in Mechanical Engineering from Kings College and a Master's Degree in Naval Architecture from University College in London. He was Chairman of the UK FD+D Club, is since 12 years a member of the Board of the Union of Greek Shipowners, President (as of 1/1/2018) of ECSA (European Community Shipowners Associations), a Member of the Committees of all major Clasification Societies in Greece, a Member of several Learned Societies, a Member of the Royal Corps of Naval Constructors, a Chartered Engineer and a Fellow of RINA, IMechE and SNAME.